The Large-Scale Ocean Physics group works to increase vertical resolution and profiling depth of Argo floats to improve their usefulness for ocean analyses. They started deploying high vertical resolution Iridium floats in 2009. They are a strong proponent of ”Deep Argo,” an expansion of Argo’s capabilities to depths of up to six kilometers. 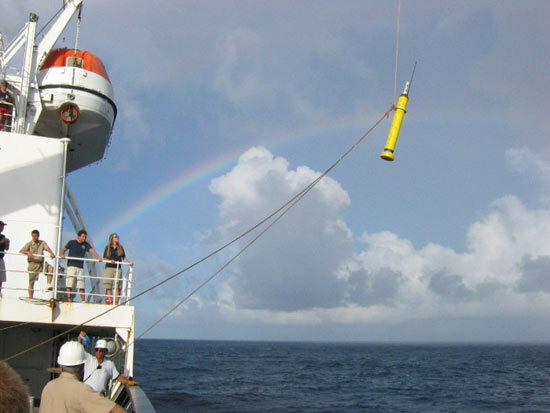 The group monitors and conducts research on ocean heat changes and their impacts, including sea level rise and climate sensitivity, using data from the global Argo floats collected since 2000, as well as deep hydrographic profiles along oceanographic transects occupied by the Repeat Hydrography Program, together with historical and satellite ocean observations. They also study the distribution and variations in ocean salinity, oxygen, and currents – and their relations to climate and ocean dynamics.